I do not know where to begin in describing this evenings dinner except to say wow, and, how did I do that? I did not write down exactly what I did today because I was not sure what I was doing. I was also really tired, hungry and also frustrated by my pasta machine because the handle kept falling off. If you want to make this, save it for when you have the full day at home, or make everything you can ahead of time. I had made the tomato sauce a couple days ago. Next time I will also make the pasta dough in advance and keep it in the fridge or freezer until the day I want to use it. Slicing the vegetables the night before would also speed things up. My lasagna history is a tumultuous one. I love the idea of lasagna but I have never made it right. I have tried every single possible variation on vegetarian lasagna that is out there and have never really been that impressed. After today's meal, I think that homemade tomato sauce might have been the missing ingredient all along. The first, fresh pasta lasagna I was introduced to was Heidi Swanson's 1000 layer lasagna, made primarily by my friend Vesna. Also, another friend of mine made her family lasagna recipe for a group of our friends one night a long time ago. Both of those lasagnas stand out in my mind as the best lasagna dishes I've ever had. The common thread in those two dishes was definitely fresh pasta noodles. But I have also made lasagna with my own fresh noodles, and let me tell you that those alone are not enough. The simplicity of those recipes also stands out in my mind as being important to their success. Today, my motivation for making lasagna was having so many vegetables to use up; I wanted to put a dent in my supply. First, I used a very deep orange, buttercup squash, from Mike's parents garden. I think the rich flavour of this squash, sweetened with a touch of sugar, was one of my favorite parts of the lasagna. I also used young, tender, yellow zucchini squashes from the farm fields that my uncle lives on, another perfect ingredient. Then I used a regular old eggplant. All three of these vegetables offered an essential taste and texture. I also had some roasted red onion in there, which was naturally sweetened from roasting. I liked just a touch of the onion in the lasagna but it was not necessary. I did not think I was going to want to write about this lasagna because of my many previous failures. I changed my mind after dinner. After having three pieces of lasagna each, Mike and I just stood in the kitchen staring at the last quarter of the lasagna left in the baking dish. We contemplated eating more but we were both too full and also discussed that we did not want it to be all gone because it was too precious. I would not describe the taste as simple, I would actually describe it as complex; there was an overabundance of flavors, every bite subtly different and delicious. 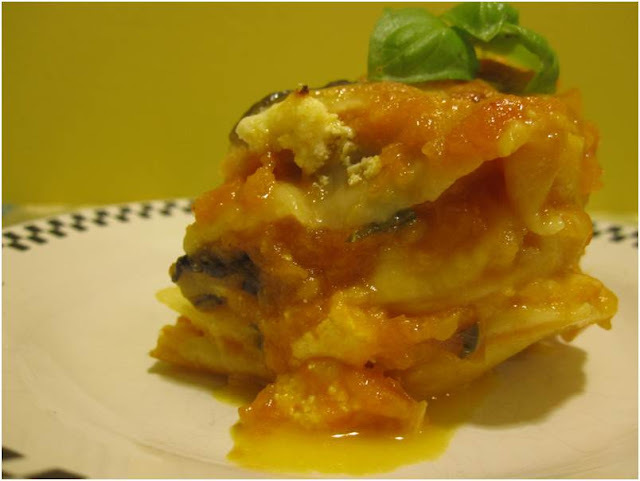 Roasted fall vegetable and fresh pasta noodle lasagna. *This dish is not about technique. It is about the ingredients. If you substitute store bought sauce and noodles I cannot guarantee you will enjoy it as much as I did. *I am estimating my ingredient amounts below, so use your judgment and adjust if necessary. 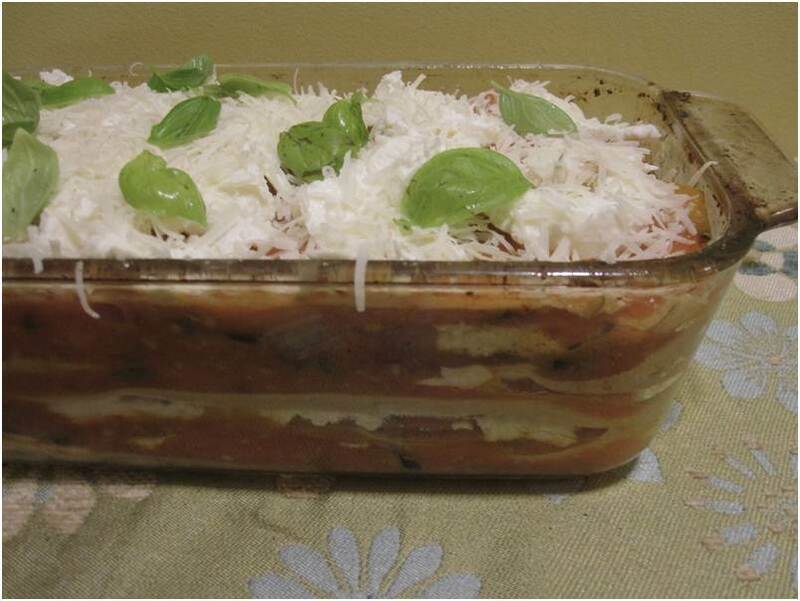 The ingredients should be enough for 2 lasagnas made in a 6" X 10" baking dish (3" deep). I only made one but I had a lot of leftover ingredients. 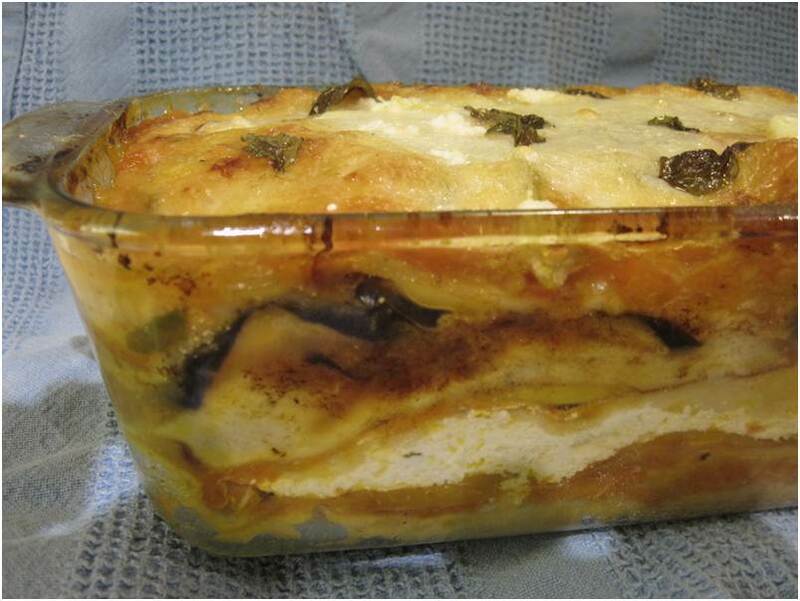 A deep baking dish is needed to accommodate layers. *The pasta recipe I always follow is from Mario Batali but I find that I can never incorporate all of the flour recommended into the dough. Also, I do not precook the noodles so I made sure to use enough sauce to cook the noodles while it baked. 1 - Start by roasting all of the vegetables, including garlic. For the squash, toss the slices in olive oil and about 2 tsp or more of sugar. Spread out on a baking sheet and roast until lightly browned, turning once (should only take ~ 8 minutes). Do the same for the eggplant and zucchini, except season with salt instead of sugar. The eggplant will take the longest. Remember that everything will be baked later on so the vegetables do not have to be perfectly cooked. 2 - Make the pasta dough. Put ~ 2.5 - 3 cups of all purpose flour into a large bowl or on your counter. Break 4 eggs into a well in the middle of the dough. Whisk the eggs, in the flour, with a fork and start to incorporate the flour with the fork, working your way out. Once the dough starts to firm up, use your hands to knead and incorporate more flour. Spend about 10 minutes working as much flour into the dough as you can. Once the dough is fairly firm, continue to knead on lightly floured surface for 5 - 10 minutes. Cover dough and let it rest while you prepare the rest of your ingredients and tend to your roasting vegetables. 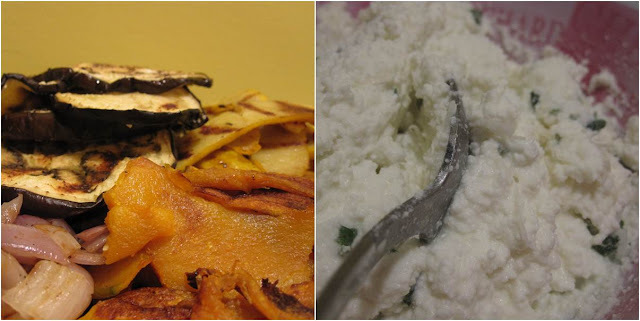 3 - Mix ricotta with chopped basil, 1/2 of the grana padano and season well with salt. Also, using a garlic press, squeeze in your roasted garlic. It should be soft, but does not need to be fully roasted (20 minutes should be good). 4 - Split the dough into 8 pieces. Start rolling them with a pasta roller, starting with the thickest setting, working up one step at a time to the thinnest setting. I just go through each setting once. Mario Batali does several folding and rolling stages. At about stage 7, cut your sheet in half and roll two peices seperately. You will end up with 16 sheets total and they should fit fairly perfectly into the dish I described above. 5 - Coat your lasagna pan with butter or oil (I used basil infused olive oil). 6 - Lay one sheet of pasta on the bottom. Cover pasta with a generous amount of sauce. Then cover with a layer of ricotta mix. Then layer 1/4 of the squash. Cover with a layer of noodles and another layer of sauce and ricotta, then a layer of eggplant and some red onion. Cover with noodles, sauce, ricotta and then zucchini. Layer on 1/4 of the bocconcini and cover with noodles, sauce and 1/4 more of the squash. 7 - End with a lasagna noodle, sauce and top with 1/4 bocconcini and 1/4 of the grana padano and some basil. Squeeze in a couple extra layers of pasta and sauce somewhere in between if you can fit it. 8 - Bake for 30 - 40 minutes at 375F. Let sit for 5 - 10 minutes before eating. Ooohw yeah. Love a lasagna. Even a meatless one.